Submerged macrophyte Vallisneria spiralis and sediment microbial fuel cell (SMFC) systems are cost-effective methods for the remediation of polycyclic aromatic hydrocarbon (PAH)–polluted sediments. This study evaluates whether the combination of these two ecological approaches could further improve the removal efficiency of PAHs from sediments and investigates the possible mechanisms of removal. Sediments, macrophytes, electrodes, and plexiglass columns were used to construct an experimental microcosm. A 65-day comparative study was performed with six treatments as follows: SMFC without PAH (SMFC); PAH only (PAH); SMFC with PAH (SMFC-PAH); V. spiralis without PAH (macrophyte); V. spiralis with PAH (macrophyte-PAH); V. spiralis with SMFC and PAH (M-SMFC-PAH). Pyrene and phenanthrene were added to raw sediments to obtain initial PAH concentrations of 10 mg kg−1 dry sediment. 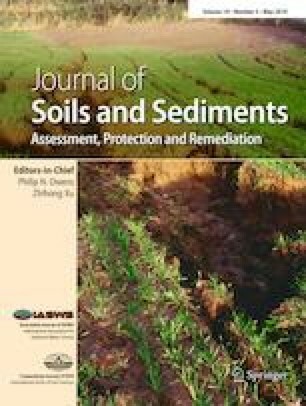 The monitored parameters were sediment oxidation–reduction potential (ORP); low molecular weight organic acids (LMWOAs) and Fe (II) concentrations in pore water; electron acceptor (sulfate and Fe (III)), humic acid (HA), and PAH concentrations in sediments; and plant morphology and root physiology. 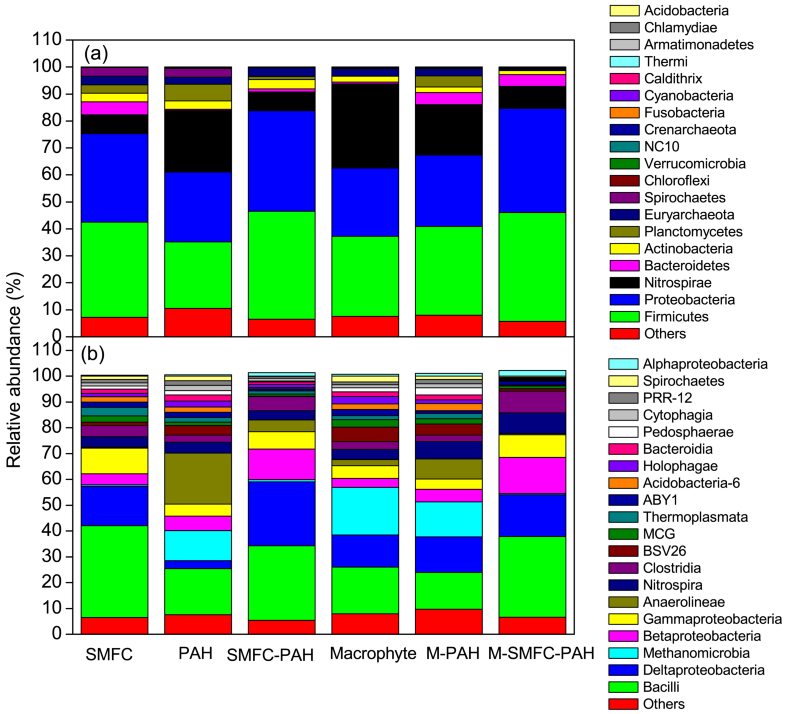 High-throughput 16S rRNA gene sequencing was also performed to assist mechanistic understanding. The M-SMFC-PAH treatment obtained the highest sediment ORP and PAH removal efficiency. The average ORP level in M-SMFC-PAH was increased by 57.2, 59.1, and 168.4 mV, compared with the SMFC-PAH, macrophyte-PAH, and PAH-only treatments, respectively, with a mean value of 121.7 mV observed during the whole experimental period. The pyrene (phenanthrene) dissipation ratios at the end of the experimental period were 29.1% (35.4%), 45.5% (56.3%), 59.8% (67.3%), and 79.4% (88.2%) for PAH only, SMFC-PAH, macrophyte-PAH, and M-SMFC-PAH treatments, respectively. The highest correlation was observed between PAH concentration and sediment ORP value, in the coupled M-SMFC-PAH system. Results suggest that the interactions between the anode and rhizosphere of V. spiralis were synergistic during PAH removal. The coexistence of anodic and rhizospheric oxygen loss in sediments had a synergistic effect on PAH degradation. Plant presence facilitated the electrogenic degradation of PAHs. The inhibited growth of V. spiralis due to PAH toxicity was reduced by electrogenesis, thus facilitating the removal of vegetable PAHs from sediments. Coordinated growth of anaerobic and aerobic PAH degrading bacteria on the anode was a key factor in the optimal removal of PAHs in coupled systems. The online version of this article ( https://doi.org/10.1007/s11368-019-02247-0) contains supplementary material, which is available to authorized users. This work was financially supported by the National Key Research and Development Plan of China (2016YFC0500403-03) and the Science and Technology Service Network Initiative of the Chinese Academy of Sciences (KFJ-STS-ZDTP-038). We would like to thank Dr. Lin Qingwei, Dr. Min Fenli, and Mr. Dai Zhigang for their assistance.